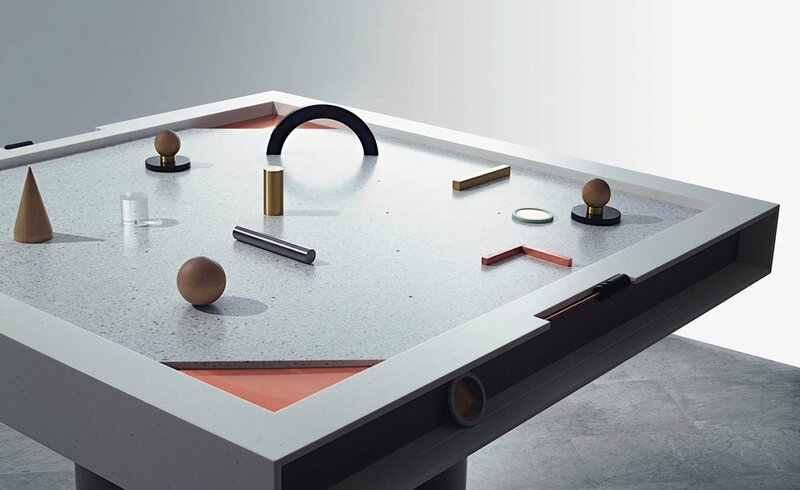 Wallpaper* Handmade invited L&G Studio to design a bespoke air hockey table based off the theme which focused on food, drinks and entertaining. When Ladies & Gentlemen Studio was asked to design an air hockey concept, their starting point was the image of 12-year-old boys playing furiously in a games arcade. 'How can we turn this into a more elegant game but still keep it fun?' they asked. The answer is a simple yet elegant design using a sophisticated material pallet made from Corian to make the custom table, air hockey p. It combines a minimalist look with a new gaming approach, adding playful obstacles and angular scoring ports. Each obstacle shape can rearranged or stowed away on the side of the table.